2-2.5: Very mediocre. Not bad, not very good. 3-3.5: Slightly above average. Pretty solid. 4-4.5: Very good. A must buy. 5: Perfection, a product that must be purchased 100%. Verdict: Very good. A must buy! Based on the box which I opened, I would score this Pacific attempt at a 4.5 out of 5. The jersey cards are very nice and fall one per pack. The jerseys are all serial #d on the reverse of the card and feature the base gold foiled version, a #/75 red version, and a patch variation #/50 falling one per box. There are also serial #d base parallel cards, rookie cards, and a very nice foil design which makes this product nearly perfect. Perfection is hard to come by, but in the world of pre-lockout hockey cards, this is as close to a perfect box as you can get. 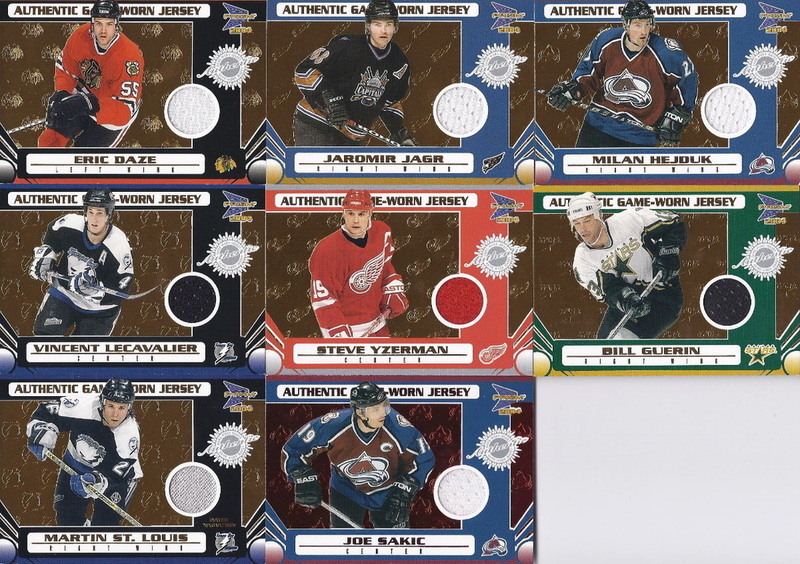 Would you rather spend $60 and get the box I purchased, with Yzerman, Sakic, Jagr, St. Louis, and Lecavalier jerseys, or $200 on SPGU in order to get dollar bin throwaway cards? Don't argue, you know the answer. Good selection of players for the "hits"
2003-04 Pacific Calder was a product that I have never personally broken before so I truly did not know what to expect from it. What can I say, the product definitely lived up to the Pacific name as it delivered on many levels. At 24 packs per box, and retailing at an LCS price of $50, it was quite unexpected to see that there was not a single base-only pack in the box. I ended up with 21 serial #d cards (ranging from true-rookies, to Pacific Complete reds, to silver parallels), 2 Calder Reflections inserts, and 2 memorabilia cards out of 24 packs. The player selection once again found a decent balance between the hot rookies of the day and the established stars. The design of the cards were nice, but I found the base cards to be rather busy on the background, regularly detracting from the player picture on the front. 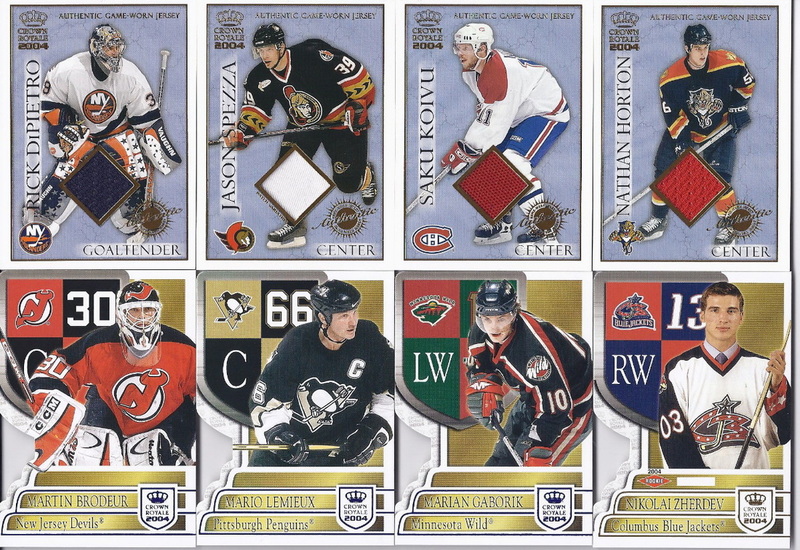 The memorabilia cards had an absolutely beautiful design, one of the best of the pre-lockout era in my opinion. Everything about this product was fun to open, and sure there were no big-money hits per se, but Pacific was one of the few companies to have passion for their card quality, a passion that only one other hockey card company holds to this day. Verdict: Above average. Pretty solid! Overall, this particular product finds sort of an odd spot in the hobby. For one, this is a fine example of what made Pacific great. The average hobby box contains a dozen+ serial #d cards, a jersey card, as well as a 1:2 box chance at a hand-numbered/hard-signed autograph of an up-and-coming player. 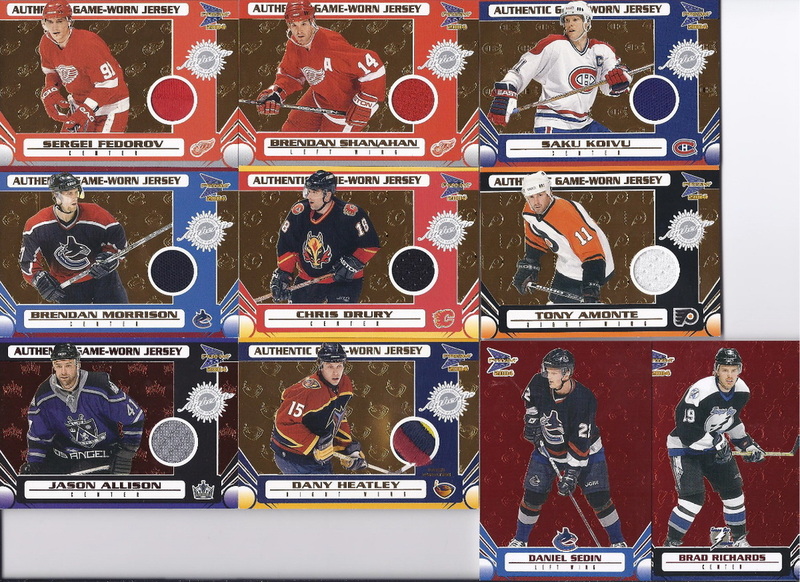 The design is very clean and looking back with 2012 eyes, it is interesting to see how so many of the players depicted on those cards saw some NHL time. On the other hand, however, the product is not perfect. Because it as an AHL-only set, it is very niche and likely to appeal only to player collectors, Pacific fanatics like myself, and fans of the American Hockey League. There is no chance at cards of true star players. Regardless, the product was too much fun to open! Back for a final run under the Pacific brand name, Crown Royale proved that it can still be an excellent product. It features one blue parallel #/850 in each pack (or a rare red parallel #/5), four game-used hits (one of which is a patch) per box, and plenty of inserts and rookies to keep your attention. Its design is solid, but not jaw-dropping. By now, everybody is familiar with what Crown Royale of Pacific and then Panini stand for, so I really do not need to say much more about this edition! Back after a strong outing with their previous year's bobblehead edition, Pacific released the sweater edition with a lot to live up to. Did they? I would say that they almost matched the product, but they certainly did not exceed it. Unlike the previous year, the pack count has been raised to 24 to go along with the special item, in this case, a mini jersey on a stand that is included. I always love when extra stuff are included with cards, so that is definitely a plus in my books. Now, to the product itself. In the 24 packs, there were 24 total hits comprising of 8 serial #d cards, 2 memorabilia cards, and 14 inserts. No base packs was a positive thing for sure. The designs of the inserts were inspired as usual, though the memorabilia cards represented a major step down from the previous year. The 02-03 edition featured quad memorabilia jerseys, as well as gold versions of those. 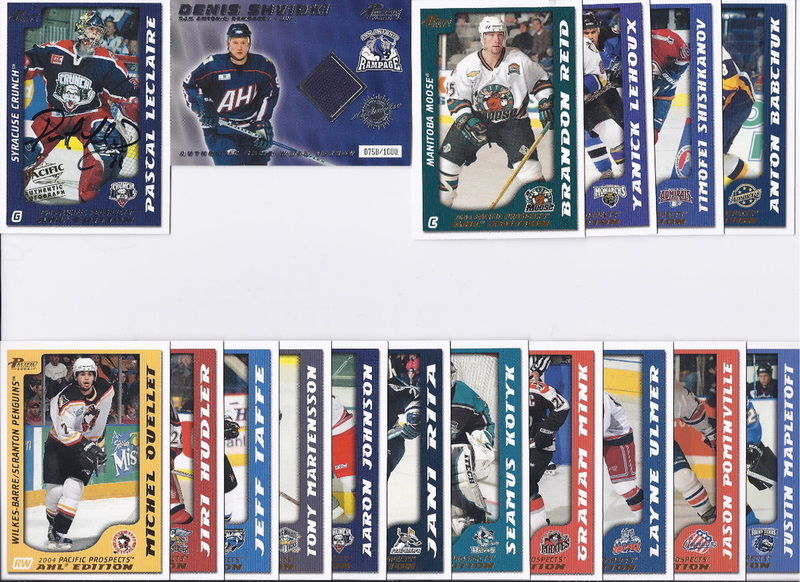 The 03-04 edition features one-type of single-player memorabilia card, that is definitely not short-printed (they had the audacity to serial # the memorabilia cards out of 1200). 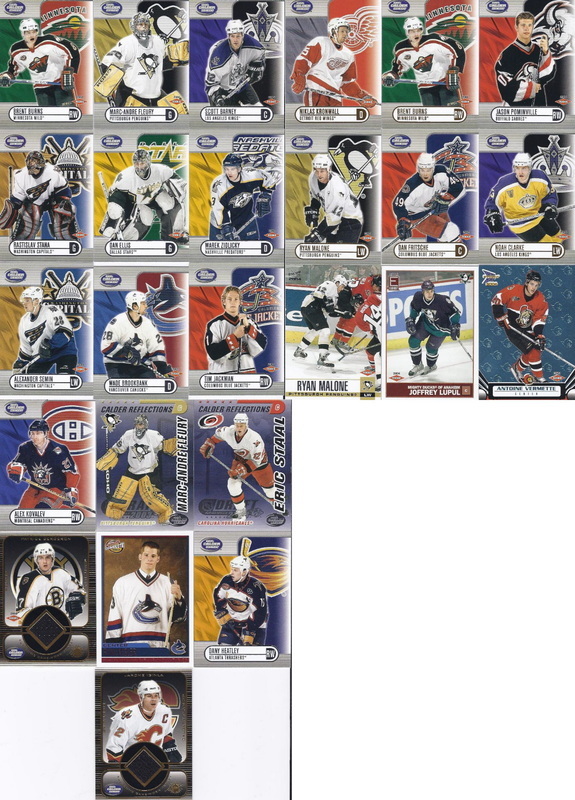 The serial #d parallels certainly do not provide the fun chase that the 02-03 edition delivered. The 02-03 edition featured blue parallels, red parallels, and purple parallels, each more difficult than the rest to find. The 03-04 edition featured Hobby Ltd. parallels of both base and insert cards in the hobby version and Retail Ltd. in retail boxes. They were numbered to 299 and certainly not a madly sought-after parallel like the various colors in the year before. The base card design was inspired once again and put the player in the foreground with much detail and clarity.